The bandname came from Ulrich's friend Ron Quintana, who was brainstorming names for a fanzine and was considering MetalMania or Metallica. Dave Mustaine replied to an advert for a lead guitarist; Ulrich and Hetfield recruited him after seeing his expensive guitar equipment. In early 1982, Metallica recorded its first original song, "Hit the Lights", for the Metal Massacre I compilation. 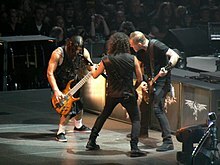 Hetfield played bass,rhythm guitar and sang while Lloyd Grant was cred with a guitar solo and Lars Ulrich played drums. Metal Massacre I was released on June 14, 1982; early pressings listed the band incorrectly as "Mettallica", angering the band. The song generated word of mouth and the band played its first live performance on March 14, 1982, at Radio City in Anaheim, California, with newly recruited bassist Ron McGovney. Their first live success came early; they were chosen to open for British heavy metal band Saxon at one gig of their 1982 US tour. This was Metallica's second gig. Metallica recorded its first demo, Power Metal, whose name was inspired by Quintana's early business cards in early 1982. Metallica recorded its second studio album, Ride the Lightning, at Sweet Silence Studios in Copenhagen, Denmark. It was released in August 1984 and reached number 100 on the Billboard 200. A French printing press mistakenly printed green covers for the album, which are now considered collectors' items. Mustaine received writing cr for "Ride the Lightning" and "The Call of Ktulu". Elektra Records A&R director Michael Alago, and co-founder of Q-Prime Management Cliff Burnstein, attended a Metallica concert in September 1984. They were impressed with the performance, signed Metallica to Elektra, and made the band as a client of Q-Prime Management. Metallica's growing success was such that the band's British label Music for Nations released Creeping Death as a limited ion single, which sold 40,000 copies as an import in the U.S. Two of the three songs on the record—cover versions of Diamond Head's "Am I Evil?" and Blitzkrieg's "Blitzkrieg"—appeared on the 1988 Elektra reissue of Kill 'Em All. Metallica embarked on its first major European tour with Tank to an average crowd of 1,300. Returning to the U.S., it embarked upon a tour co-headlining with W.A.S.P. and supported by Armored Saint. Metallica played its largest show at the Monsters of Rock festival at Donington Park, England, on August 17, 1985, with Bon Jovi and Ratt, playing to 70,000 people. At a show in Oakland, California, at the Day on the Green festival, the band played to a crowd of 60,000. Following the release of ...And Justice for All, Metallica released its debut music video for the song "One", which the band performed in an abandoned warehouse. The footage was remixed with the film Johnny Got His Gun. Rather than organize an ongoing licensing deal, Metallica purchased the rights to the film. The remixed video was submitted to MTV with an alternative, performance-only version that was held back in case MTV banned the remixed version. MTV accepted the remixed version; the video was viewers' first exposure to Metallica. In 1999, it was voted number 38 in MTV's "Top 100 Videos of All Time" countdown; it was featured in the network's 25th Anniversary ion of ADD Video, which showcased the most popular videos on MTV in the last 25 years. Metallica's World Magnetic Tour ended in Melbourne on November 21, 2010. The band had been touring for over two years in support of Death Magnetic. To accompany the final tour dates in Australia and New Zealand, a live, limited ion EP of past performances in Australia called Six Feet Down Under was released. The EP was followed by Six Feet Down Under (Part II), which was released on November 12, 2010. Part 2 contains a further eight songs recorded during the first two Oceanic Legs of the World Magnetic Tour. Metallica has become one of the most influential heavy metal bands of all time, and is cred as one of the "big four" of thrash metal, along with Slayer, Anthrax, and Megadeth. 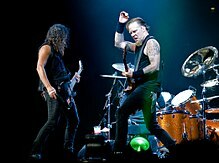 The band has sold more than 125 million records worldwide, including an RIAA-certified 66 million and Nielsen SoundScan-reported 58,000,000 in the US, making Metallica one of the most commercially successful bands of all time. The writers of The Rolling Stone Encyclopedia of Rock & Roll said Metallica gave heavy metal "a much-needed charge". Stephen Thomas Erlewine and Greg Prato of Allmusic said Metallica "expanded the limits of thrash, using speed and volume not for their own sake, but to enhance their intricately structured compositions", and called the band "easily the best, most influential heavy metal band of the '80s, responsible for bringing the music back to Earth". Kerrang! released a tribute album titled Master of Puppets: Remastered with the April 8, 2006, ion of the magazine to celebrate the 20th anniversary of Master of Puppets. 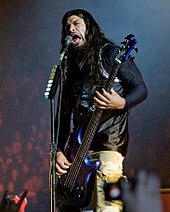 The album featured cover versions of Metallica songs by Machine Head, Bullet for My Valentine, Chimaira, Mastodon, Mendeed, and Trivium—all of which are influenced by Metallica. At least 15 Metallica tribute albums have been released. On September 10, 2006, Metallica guest starred on The Simpsons' eighteenth-season premiere, "The Mook, the Chef, the Wife and Her Homer". Hammett's and Hetfield's voices were used in three episodes of the animated television series Metalocalypse. Finnish cello metal band Apocalyptica released a tribute album titled Plays Metallica by Four Cellos, which features eight Metallica songs played on cellos. A parody band named Beatallica plays music using a combination of The Beatles and Metallica songs. Beatallica faced legal troubles when Sony, which owns The Beatles' catalog, issued a cease and desist order, claiming "substantial and irreparable injury" and ordering the group to pay damages. Ulrich, a fan of Beatallica, asked Metallica's lawyer Peter Paterno to help settle the case.